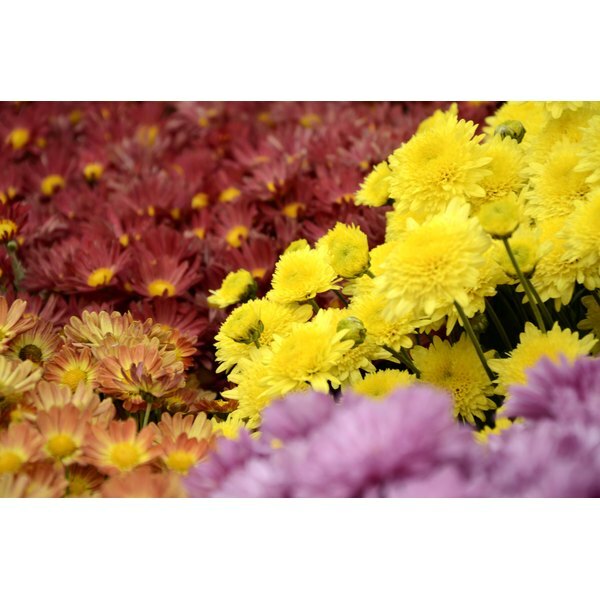 Mums enable you to bring all the colors of fall into your wedding. 4 What Flowers Are in Season in November? Fall weddings provide the once-a-year opportunity to showcase brilliantly colored mums throughout your decorating scheme. From lime colors -- rare in the flower world -- and fall bronzes to traditional whites and yellows, mums give off a sense of softness and warmth. The size variety helps create visual interest while keeping a consistent flower theme. Many flowers make up the chrysanthemum family and they don't all look alike. Daisy mums are one of the most common varieties, and cushion mums look similar to daisies without the dark center. Button mums are smaller and a bit more rounded. For big impact, the larger mums include spider and football types. Both have flower heads that can get up to 6 inches wide. Spider mums look almost like a firework burst, with long, thin, straight petals; football mums have petals that grow out then curl inward for more of a rounded appearance. All of these mums may enhance your wedding decorations, even when mixed. Mums tend to be hardy; they often last for hours -- long enough for a wedding or reception -- with little or no water, making them good choices for bouquets and other wedding arrangements. The bridal bouquet is the most important element of the wedding-party flowers and may showcase the mums to set the tone for the rest of the event. This is an ideal place to use larger mums such as spider mums, surrounded by the tiny buttons or fluffy cushion mums. In the fall, bronze-colored mums bring the season into the wedding. Bridesmaid bouquets may be smaller versions of the bride's with the same flowers, or you may eliminate the large mums and stick to smaller ones so the bridal bouquet remains more dramatic. Even though football mums once were traditionally used as corsages, their large size makes them unwieldy and uncomfortable. Stick to smaller mum arrangements when designing boutonnieres and corsages for the wedding party for a more modern look. Whether the wedding is indoors or outdoors, lining the aisle with potted mums creates an elegant pathway for the bride -- almost like she's walking through a meadow. Potted mums situated on pedestals of different heights around the alter make an attractive backdrop for the wedding party. Hooking small bouquets of mums of various sizes and colors on the backs of chairs or the center pew arms brings more pop to the ceremony. In many cases, guests spend more time at the reception than the wedding, and the variety of floral decorations should reflect that. Although potted mums work in various locations such as small ones as centerpieces or on the serving tables and larger ones framing the dance floor, creative use of other fall materials helps make the arrangements more memorable. Hollowed-out pumpkins serve as vases for cut mum arrangements or pots for potted mums. Or wrap cylinder vases with birch bark and fill them with cut mums to help showcase the season. Small, cut mums mixed with tiny pine cones top a bride's cake beautifully. Cover a ball of florist foam with cut mums and perch the balls atop cylinder vases or gather them in baskets to create unusual centerpieces.